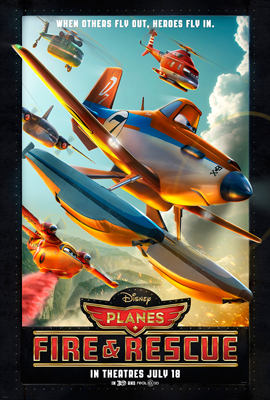 Almost a year after the first “Planes” movie was released, the folks at Disneytoon are back again with an adventure featuring Dusty Crophopper (Dane Cook), the mild-mannered crop duster-turned-racer. This time out, our story opens with Dusty sustaining critical damage to his gear box, a part long since out of production, putting him at risk of crashing when he pushes the needle into the red. His very real concern about crashing puts him in a metaphorical tailspin, leading the depressed Dusty to go on a flying bender that ends with him careening into a pylon and accidentally starting a fire. The haphazard firefighting by Propwash Junction Airport’s sole – and well-past decrepit – fire truck, Mayday (the prolific Hal Holbrook – “Wall Street” and “Lincoln”), exposes the airport’s lack of sufficient fire safety equipment. Immediately thereafter, the authorities sweep in and pull the airport’s license to operate until there are at least two pieces of firefighting equipment onsite. Looking for meaning in his life, or at least to help out his friends, Dusty volunteers to undergo the certification required for the airport to re-open, and he flies up to scenic Piston Peak National Park, to study under the taciturn helicopter Blade Ranger (Ed Harris – “The Truman Show” and “Apollo 13”). The lovely park is hugged by trees, hills, and a gulch with a raging river, and it features the stunningly renovated Fusel Lodge which is managed by the arrogant Superintendent, Cad (John Michael Higgins – “Bad Teacher” and “Pitch Perfect”). As much as Blade wants to make even minor improvements to the firefighting capabilities of his crack team, Cad is focused solely on the grand re-opening of the Lodge, gushing over the champ and ignoring the heroes. Dusty makes friends with members of Blade’s team, including the amorous Lil’ Dipper (Julie Bowen – “Ed” and “Modern Family”), the philosophical Windlifter (Wes Studi – “Last of the Mohicans” and “Avatar”), and crazy smokejumper Dynamite (Regina King – “Boyz n the Hood” and “The Boondocks”). Though Dusty learns the mechanics of fighting fires, his impulsive decisions override his training and put him on Blade’s bad side. When Blade suffers injuries from compensating for Dusty’s mistakes during a wildfire, Windlifter is left to direct the team as the fire spreads close enough to threaten the Lodge and all its visitors. Dusty has to put his own personal safety on the line to prove to everyone – and himself – that he has what it takes to be a true hero. Ultimately, I found the movie to be just okay. Understanding that the first “Planes” movie was originally intended to be a direct-to-DVD movie that detoured to the theaters, this felt much like something that could have gone straight to DVD. There were no visible advances in graphics or effects, the plot was fairly predictable, and it straddled an interesting line between repetition and sophomore slump. The movie has some cute moments, and the casting is truly wonderful, but the drive to see it will be fueled primarily by Dusty-philes and merchandising. The two big questions that I typically see pop up around these movies are: should I see this in 3D and is it too scary for my child? As to the question of whether to see this in 3D or 2D, I’d say that there’s no tangible benefit to seeing it in 3D. Frankly, the best use of the 3D display was in the end credits – and that’s insufficient to justify the surcharge. When it comes to the scare factor, the scenes with the fires (two of which are probably a bit scary for those under 7) are likely to be the biggest issues. Dusty and the Piston Peak team are put in harm’s way, and though the graphics aren’t hyper-realistic, I can imagine that some kids might find even those brief scenes a bit tough to take. In the end, “Planes: Fire and Rescue” does the job it sets out to do; it continues this fork of the “Cars”-world franchise and it offers all new characters for kids to collect at their local stores. Parents can expect some amusing one-liners and great cameos, and kids get to see Dusty in action all over again. For many, that’s reason enough to head to the theater. “Planes: Fire and Rescue” opens nationwide starting July 18, 2014. This movie is rated PG for action and some peril. This entry was posted in movie reviews and tagged Blade Ranger, Disney Planes, disneytoon, Dusty Crophopper, fire and rescue, Lil Dipper, Planes, planes fire and rescue, Windlifter by crunchymetromom. Bookmark the permalink.